We see many cyclists and triathletes with movement issues, some of which can be addressed with bike set up, but many of which are to do with how they use themselves. One of the common issues is hip tightness. Although there are several mechanisms for this, one of the common presentations we see is what we would call a complex hip strategy. This means that the cyclist is using excessive tension in the muscles surrounding the hip, including those in the trunk. This gives rise to a sense of congestion in the hip and that it is more effort to bend, and sometimes even causes the cyclist to tip their pelvis from side to side in an effort get around the restriction. Simple, clean, efficient, go all day hip bending is lost. Sit on a chair with your feet flat on the floor, preferably in front of a mirror or your iPad camera. Lift your arms slightly to the sides. Now lift one knee. What should you see? You should see that the leg lifts straight upwards, with the knee neither moving in nor out. 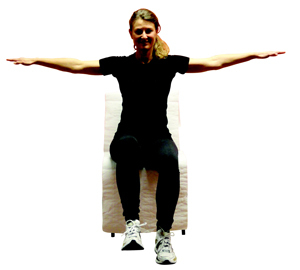 The lower leg should drop vertically towards the floor. Your abdominal wall should look relaxed, and your belly button should be pointing forward. Both sitting bones should be evenly placed on the chair. Your arms and shoulders should have remained level, neither pulling up nor down. This is simple hip bending, without interference. At this level, there should be no additional tension anywhere, and if there is, you know it is going to be amplified on the bike! The key here is not more core stability, but the coordination between trunk, pelvis and hip. Practice keeping both sitting bones on the seat and floating that knee up without needing to pull your trunk down or sideways. More information for cyclists in coming in Your Personal JEMS. For further tips and inspiration on moving beautifully, check out our video page.